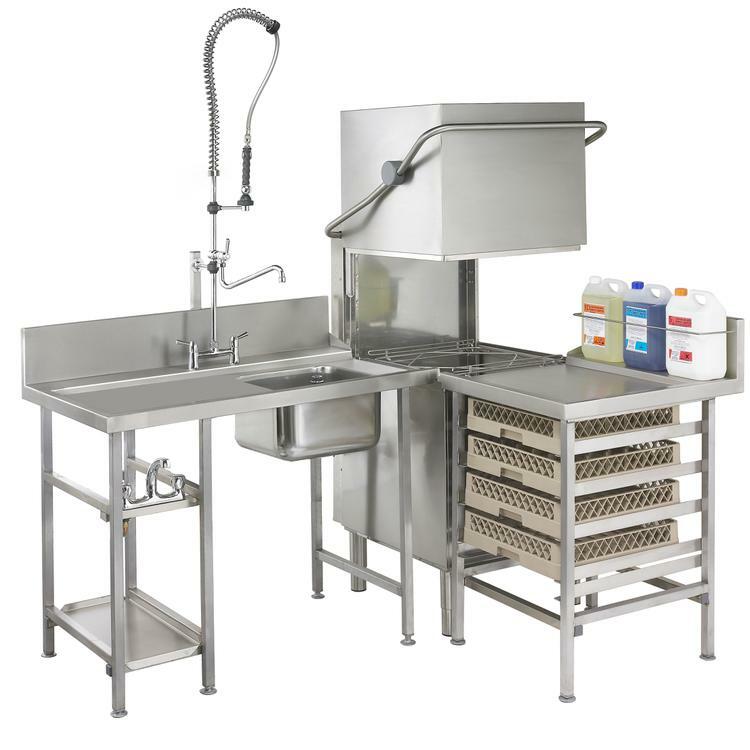 We offer a comprehensive range of dishwasher tables and wash area sinks to meet all of your dishwashing and washroom needs. The layout, type and design of your tables and sinks will determine the productivity of your wash area – i.e. how efficiently and effectively your kitchen-ware is washed. Space available – the layout, plumbing, space available for equipment – height, depth width, working space, position of services and space for all of the equipment you need in the wash space. Key washing requirements – what kitchen ware do you want to wash? Will you need a potwash area? How many sinks do you need and what size? A prewash area is normally required. Sink size – Too small and your larger items are impossible to wash. Too large and you’ll be forever filling them and also if they’re too deep your staff will have issues continually bending over the sinks. There can also be issues with overly deep sinks if you want to store underneath the sink – remember the U trap. Workflow – This is a key consideration when considering efficiency of the washing operation. Elimination of unnecessary steps is key to reduction in labour time and cost. Think LEAN! No interruption, detours, backflows or waiting. Draining requirements – You’ll need a large enough clean table for the dishwasher specified. The length will normally be determined by the size and speed of the dishwasher but also the speed at which the clean items are cleared away. You may need a cutlery polisher at the end of the clean table. If you’re a food producer you may need to stack some items to air dry. Your dishwasher – Under-counter, Pass-through, Rack conveyors all have different footprints. Some have different entry and exit dimensions affecting the table dimensions. Storage – For convenience and hygiene, baskets and chemicals can be stored off the floor. Shelves and drawers incorporated into the tabling might also be useful. In some circumstances baskets can be put onto trolleys designed for this purpose. Ergonomics – To protect your workers and reduce likelihood of work related injury, lifting and bending should be eliminated wherever possible. For example - think about getting your under-counter off the floor; make sure your prewash is connected to your dishwasher to avoid lifting; if you have rack conveyor, consider an angled roller entry table to reduce manual work. Actively engaging with ergonomics will also have an impact on productivity. Health & Safety – is an extension to considering ergonomics. And of course you will need a sink for hand washing for good practice and keep your local EHO happy. Plumbing – Waste water management often causes our clients problems. Key considerations include the fall, presence of obstructions, position of entry and exit points, location of site waste pipe, the direction of the waste thereafter. The point is, careful planning on the position of your sinks and dishwasher by a surveyor and a decent dishwashing engineer/plumber can ensure that your plumbing doesn’t leak or backup. Access at Installation – Will your chosen table sink configuration fit through the door when being installed? You’d be surprised how often this is missed. Quality – The longevity of sinks and tables depends on how it is made and what it is made from. Sinks, tables must be made from rust resistant Catering grade steel throughout – not just on the surfaces. And they must be made by a reputable fabricator if you want them to last. It doesn’t have to be complicated however it does need to be thought about and we are happy to advise you. If our standard offering does not meet your requirement then we welcome the opportunity to survey your site and design a bespoke solution taking into consideration the needs of your site. In this process we will discuss with you what your objectives are and then work with you to design a solution that meets your budget and delivers the optimum workflow and results. Our standard delivery to most locations in the UK takes 2-3 days. In the event that you require a bespoke solution, the delivery is expected to take between 2-4 weeks whilst the table or sink is being constructed to your specification. The price for this is included in the price of the goods unless otherwise stated. All deliveries are single man deliveries and are delivered to the door of the business.